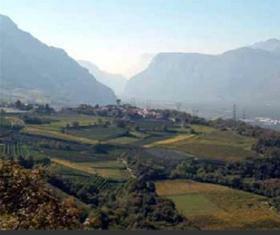 KRIS wine is handcrafted in Alto Adige using grapes sourced from Italy's most esteemed growing regions. The winery is located in the hillside town of Montagna, where culture is a unique reflection of Germanic heritage and Italian nationality. An ideal combination of traditional winemaking artistry and modern technology is used to blend each of the KRIS wines. The timeless and inspiring KRIS labels emphasize the role of the sun in ripening the grapes to perfection, the human hand in crafting the wine, and the lips that savor the wine. Riccardo Schweizer, a native of Alto Adige, studied cubism in Paris under Pablo Picasso and Joan Miró. The original paintings were given by Schweizer to his friend, the KRIS winery's founder for his birthday.